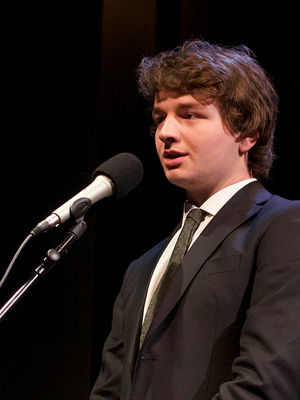 James “Jack Gulielmetti appeared on Show 289, recorded in April 2014, at age 18. James “Jack” Gulielmetti (composer), 18, is from New York, New York and attends The Calhoun School. He studies composition with Dr. Manuel Sosa at the Juilliard School Pre-College Division. His music has been performed by the New York Philharmonic on their School Day Concert Series, the New York Youth Symphony, and the JACK Quartet. James was a finalist in the ASCAP Morton Gould Young Composer Competition. He has attended the Stanford Jazz Workshop and Residency and has presented his compositions in masterclasses for composers Joan Tower, Steven Stucky, Christopher Rouse, Tod Machover, and Julia Wolfe. James plays guitar and upright bass with the Calhoun SchoolÕs string orchestra and jazz program. Outside of music, James is a peer leader at his high school, and he enjoys outdoor activities such as biking, hiking, running, and kayaking.